Health savings accounts, which have been in existence for over 10 years, are becoming increasingly popular amid efforts to stem the dramatic rise in typical health insurance costs. HSAs work hand in hand with high-deductible health plans, a type of health coverage that involves lower premiums, higher deductibles and higher out-of-pocket maximums. By the way, not all health plans with higher deductibles meet the criteria to be HDHPs. To qualify to open and contribute to an HSA, an individual must be covered by an approved HDHP. An HSA is the most tax-preferred savings account in the United States today. HSAs provide triple benefits, as funds are contributed pre-tax, grow tax-free and are distributed with no tax due as long as the money is used for health and medical expenses. IRS publication 969 outlines the rules regarding individual HSAs. Unlike a flexible spending account (FSA) or health reimbursement account (HRA), an HSA is not “use it or lose it.” An HSA belongs to the individual and is custodied by a bank, credit union or financial institution. Unused funds roll over and accumulate year to year tax-free. HSAs are assets that can be passed to a beneficiary. An effective retirement planning strategy is to maximize an HSA’s ability to provide tax-free funds for Medicare and other retirement health costs. Here’s how the strategy works: The account holder makes the maximum annual contribution to the HSA and keeps the funds in the account rather withdrawing money on a routine basis for health care expenses. This allows the balance to grow and accumulate tax-free year over year. Contribution limits ($3,350 per individual and $6,650 per family in 2015, with catch-up allowances) are based on a full calendar year of HDHP participation. 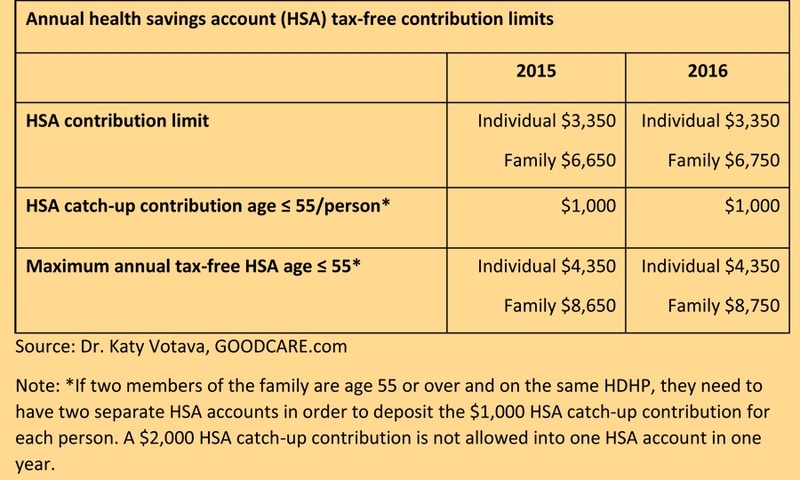 If a member is covered by the HDHP plan for less than one year, HSA contribution limits are prorated based on the number of months of participation. But if the HDHP plan starts in December, the full-year contribution limit is allowed for that year. Contributions to an HSA can be made through April 15 of the current year toward the prior year’s limits. As people accumulate larger balances in their accounts, financial institutions are responding by providing more investment opportunities, such as mutual funds, on HSA platforms. Some offer private-label HSA platforms that financial advisers can use with their clients. An important note of caution: Advise your clients not to sign up for any part of Medicare if they would like to continue to contribute to their HSA. Conventional wisdom used to say that people could/should take Medicare Part A once they were eligible at 65 even if they had another source of health coverage because there was no additional cost. That is no longer the case for those with HDHPs who would like to contribute new dollars into their HSA. If individuals choose to take Social Security retirement benefits, they must accept at least Medicare Part A. This can be an unintended consequence for those who use the Social Security retirement strategy known as file and suspend, as well as those who elect to begin receiving Social Security retirement benefits. If people contribute to an HSA when they use any part of Medicare, they could be subject to an IRS penalty. Another caveat: People who are 65 or older need to make sure that the HDHP is Medicare Part D-creditable. That allows them to use a special enrollment period to avoid coverage gaps and penalties when they enroll in Medicare Part D in the future. Given some of these rules, there are aspects of HSAs that can easily be misunderstood in retirement planning. For example, employers and individuals may think people are not allowed to contribute new dollars to HSA accounts after 65 even if they have not enrolled in any part of Medicare. Conversely, they may be contributing new dollars to HSAs when they are not qualified to do so. An HSA is an increasingly important tool in retirement planning. It provides a tax-free source of cash flow when spent on medical expenses in retirement. The fact that HSA money will not cause an income-related increase in Medicare premiums creates a double retirement-planning bonus for your clients.